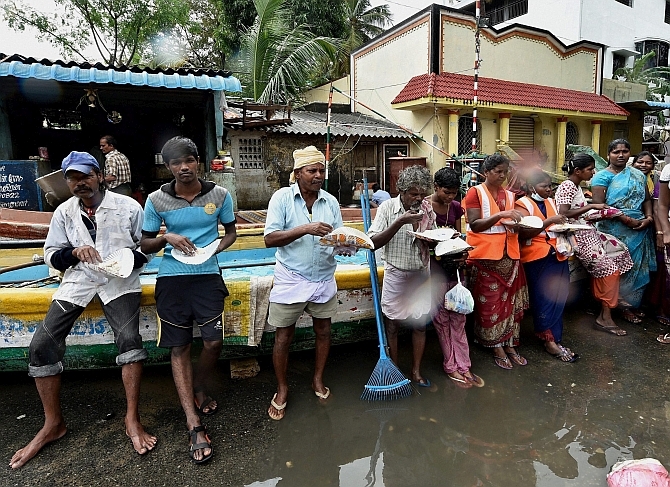 Intermittent rains on Sunday and forecast of more over the next two days kept Chennai, its suburbs and coastal districts on their toes even as normal life appeared to be returning to the flood-ravaged areas. All flight operations, domestic and international, and train services from both Chennai Central and Egmore are to resume tomorrow as water levels in the Adyar and Cooum rivers receded enabling authorities to restore tracks on Sunday afternoon. Throughout Sunday, there have been intermittent rains, which were at times heavy, in Chennai, its suburbs, Kanchipuram, Thiruvallur and Cuddalore districts where the weatherman has predicted more rains for the next 48 hours. Rain-battered Cuddalore is likely to get heavy to very heavy showers, Meteorological department said, adding that today's showers were due to a twin weather system, including formation of a new trough of low pressure over Bay of Bengal along the Tamil Nadu coast. Chennai city, which has been experiencing intermittent rains, would continue to be cloudy and rain or thundershowers, at times heavy, are likely. Power supply has been restored in several areas, while it continued to be disconnected in many others where water has not receded as a measure of precaution. Ravaged by heavy rains last week which crippled services, several private and public sector banks operated on Saturday. A big chunk of private and public sector banks functioned to clear the backlog caused by the rains which had paralysed ATM services. As a precautionary measure, the state government has declared holidays for schools and colleges on Monday in the districts, including Chennai, Kanchipuram and Tiruvallur. With an improvement in the situation, daytime commercial flights from here began with the first Air India flight to Port Blair taking off on Sunday morning. The state also ramped up its efforts to quicken relief. Ministers inspected distribution of relief in various areas, including north Chennai. Medical camps were being held across the city and suburbs. Apart from medical-checkups, 'Nilavembu Kudineer', a prophylactic herbal neem drink that controls all types of fever associated with body ache, is being given to residents. As part of the overall efforts to improve supplies of essential commodities, 11 state-run mobile fresh farm outlets began sale of vegetables in Chennai. 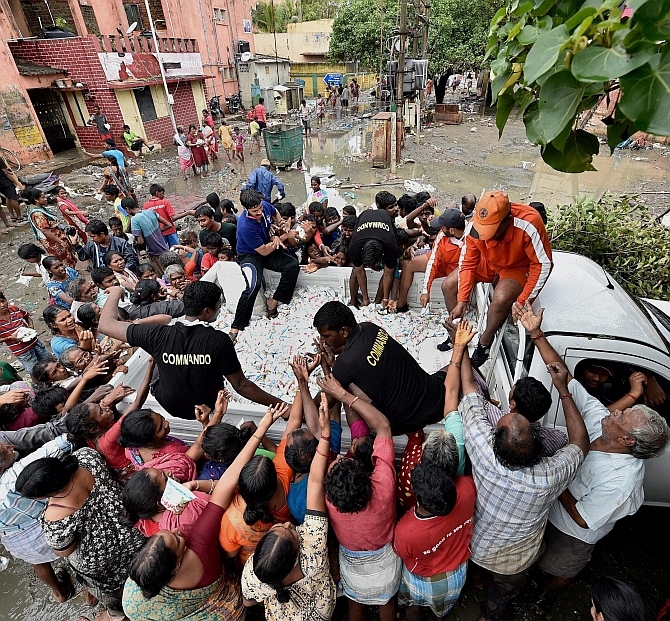 Chennai Corporation said 24,500 sanitation personnel, including 2,000 personnel from other districts were on the field to clear garbage and tidy up the city. Two columns of Army personnel have arrived in Cuddalore for relief work, where about 140 villages have been inundated. Allaying the fears of motorists over scarce availability of petrol and diesel, Indian Oil Corporation on Sunday said 81 per cent of its outlets were functioning in the city and suburbs with full stocks. 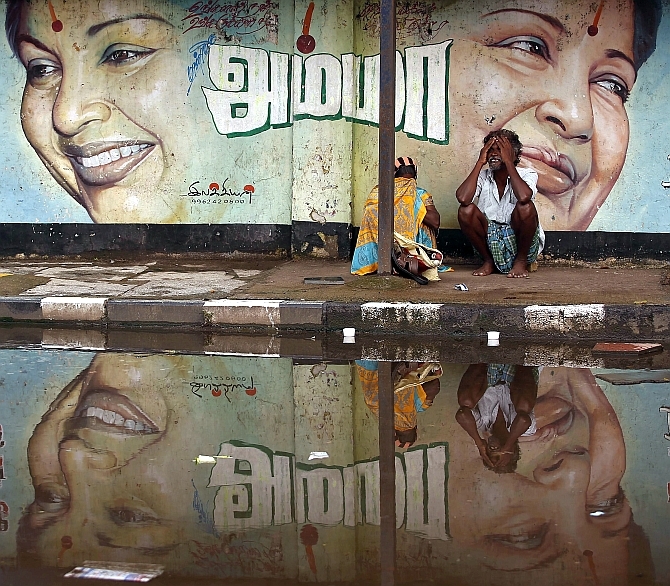 Chief Minister Jayalalithaa, meanwhile, sanctioned Rs 4 lakh compensation to each member of the next of kin of seven persons, who died in rain-related incidents from December 1-4 in various parts of Tamil Nadu, including Chennai. To avoid oxygen scarcity, 50,000 litres of medical oxygen has been procured from other states with Health Minister Vijayabaskar inspecting the arrivals, a state government release said. Recently, 18 persons died in a private hospital after back up generators were inundated, resulting in snapping of oxygen and ventilator support. In Cuddalore district, the water level at Veeranam Reservoir, that also supplies drinking water to Chennai touched 44 feet out of its total capacity of 45 feet. District Collector S Suresh said people living on banks of rivers and canals have been shifted to special camps as water level has been rising in Manimuthar and Pennaiyar rivers. Supply of milk from state-run Aavin has improved, being increased from 10.2 lakh litres to 10.8 lakh litres on Sunday. The state government said it has constituted 15 monitoring committees to ensure supply of Aavin milk and milk powder to genuine customers and those living in relief camps. 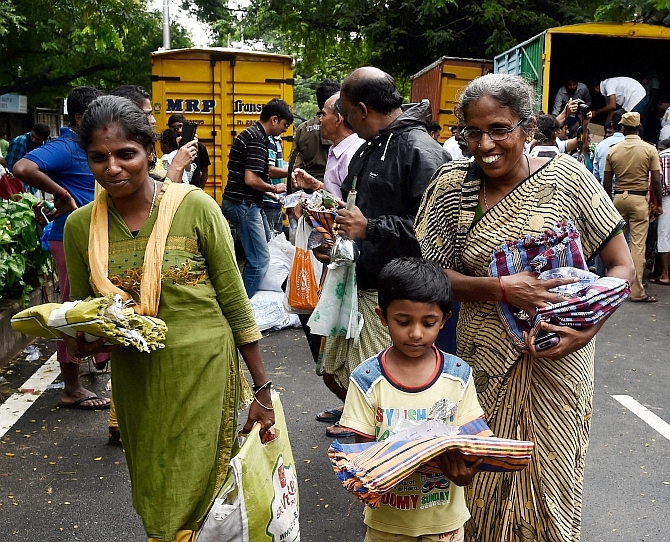 So far, 453 tons of milk powder has been distributed to people in relief camps in Chennai, Cuddalore, Tiruvallur and Kancheepuram districts, it said. Supply of vegetables saw a marked improvement though prices were on the higher side. 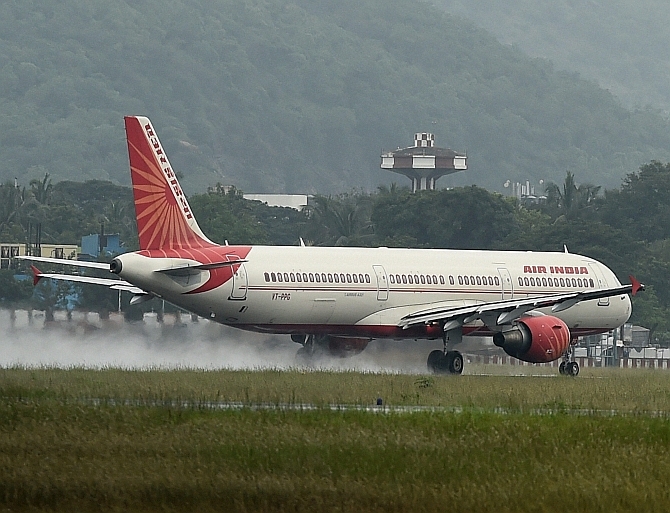 National air carrier Air India on Sunday said it operated three flights to Port Blair, New Delhi and Hyderabad after services were suspended last week in the wake of heavy rains. Airports Authority of India had declared the runway fit for operating technical ferry and relief flights after an inspection by staff on Saturday. Chennai-Port Blair flight carried 148 passengers and had 117 passengers on the return journey, airport sources said. Similarly, Air India flight from New Delhi to Chennai carried 72 passengers while there were 148 passengers on Chennai-New Delhi route. Chennai-Hyderabad Air India flight which left in the afternoon carried 67 passengers, sources said. Meanwhile, Airport Director Deepak Shastri said domestic flights are expected to be normal in the next 24-48 hours. "The airport handled three flights today and Instrument Landing System was declared safe", he told reporters. The airport would not operate at night, he said, adding more inspections would be undertaken to certify if the airport was fit for night operation. This is the first service after operations were stopped in the wake of rains. Airports Authority of India had decided to shut the airport till today in the wake of the rains that battered the facility and made it unusable. On an average, Chennai airport handles 320 landings and departures. As many as 20 international airlines operate from the airport apart from many domestic carriers.